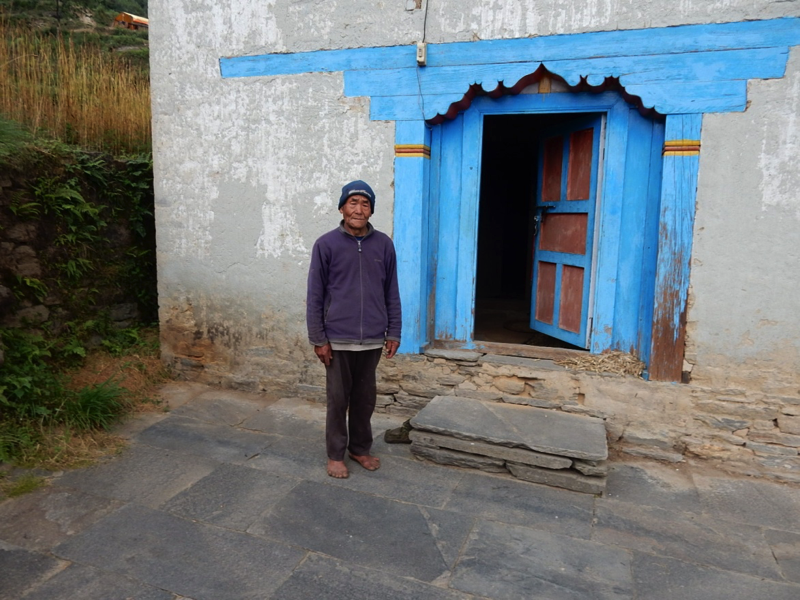 Dorji is in his early sixties and is a widower. He and his son, Dendi 43, live here along with Dendi’s daughter Gelmu, 4. He has a 3 story house but would want a smaller, stronger replacement house of 2 stories. He moved into a temporary shelter, his separate storage building, after the first quake and has stayed, as his house is uninhabitable. He was in the field harvesting barley when last one came. Again he saw his house shaking, with a wall bowing out and back in. At the same time a landslide on the other side of the house occurred. That last quake took down his kitchen cupboard and broke such things as a storage box, copper bowl, cup, thermos, and one window glass. “Life is not back to normal, and I have no idea will when it will happen. Maybe when no more aftershocks,” he said, explaining he lives in fear of the rumor of a coming quake. Two months ago he got sick, and went to a hospital in Kathmandu to get treatment.